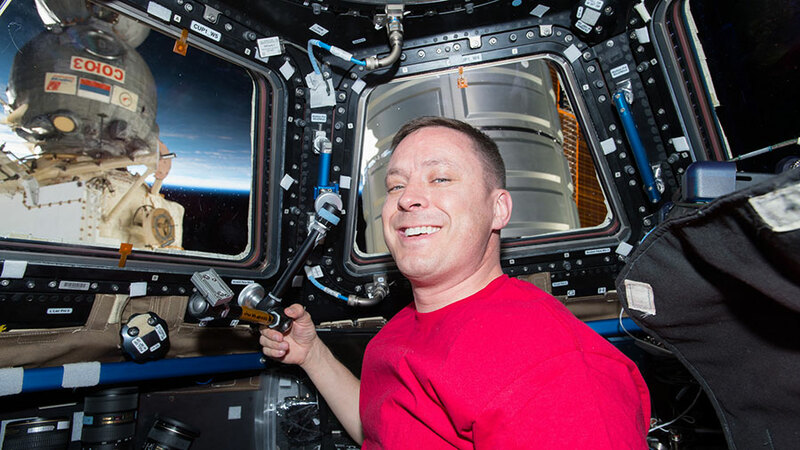 NASA astronaut Jack Fischer works inside the cupola with the Soyuz and Cygnus spaceships right outside the windows. The International Space Station is preparing this week for the departure of two Expedition 51 crew members and the arrival of the SpaceX Dragon. Expedition 52 will begin Friday morning when two Expedition 51 crew members depart the station inside the Soyuz MS-03 spacecraft. Cosmonaut Oleg Novitskiy and astronaut Thomas Pesquet will return to Earth and parachute to landing in Kazakhstan after a 196-day mission in space. NASA astronauts Peggy Whitson and Jack Fischer along with cosmonaut Fyodor Yurchikhin will continue their stay aboard the orbital complex. Whitson will hand over station command to Yurchikhin the day before the Expedition 51 crew leaves. Dragon is due to launch Thursday at 5:55 p.m. EDT atop a Falcon 9 rocket for a three-day trip to the space station. NASA astronaut Jack Fischer will command the Canadarm2 to grapple Dragon when it arrives Sunday morning. Afterward, robotics controllers on the ground will remotely install Dragon to the Harmony module. Dragon is hauling nearly 6,000 pounds of cargo to the station including new science payloads, crew supplies, vehicle hardware, spacewalk equipment and computer gear. Three new experiments are being delivered for installation on the station’s exterior. The external research gear will study flexible solar arrays, the physics of neutron stars and new ways to assist with navigation, agriculture, emergency response and petroleum exploration. I am Still Here After THE Dragon And The ISS Tried To Take My Mind. I Am THE Great Genius. I Am THE Great Genus.